pishtech.com • View topic - Please Post Your "Tharthar Lake Challenge" Scores Here! Please Post Your "Tharthar Lake Challenge" Scores Here! Please post your Tharthar Lake Challenge score and pictures here. Thank you! Re: Please Post Your "Tharthar Lake Challenge" Scores Here! The outing challenge will run for 10 days. will end on February 1, 2015 at 23:59:59 US East Coast Standard Time. Any entries caught before, or after the aforementioned dates will not be accepted for tournament results. Challenge to be done in "Experienced Mode" and no exceptions. This will be a free for all, no bars hold challenge, meaning you can use any tackle combination that you want in doing the challenge. There will be a prize for the highest points scored for the Challenge, and a second prize for the biggest fish caught while doing the Challenge. 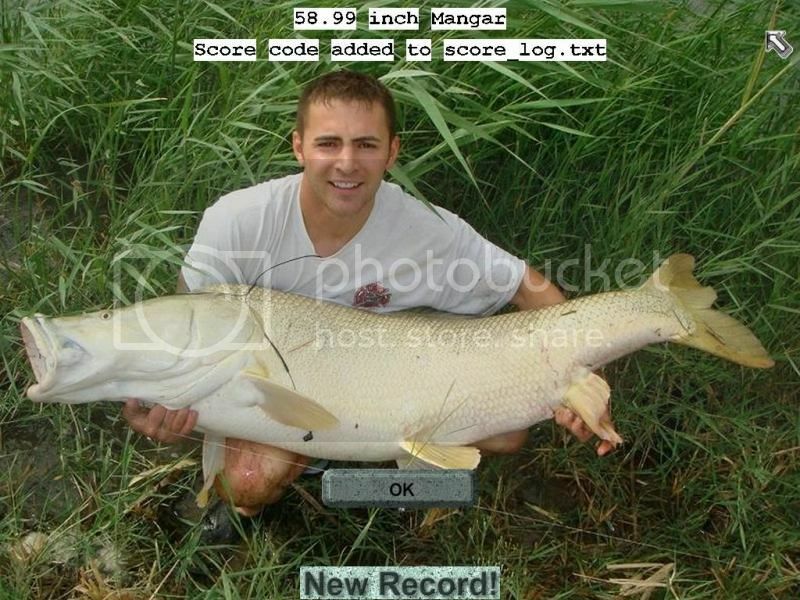 Big fish caught during "free fishing" will not be counted. The caught scores and complete caught codes must be sent to Roger for verification before they become valid. 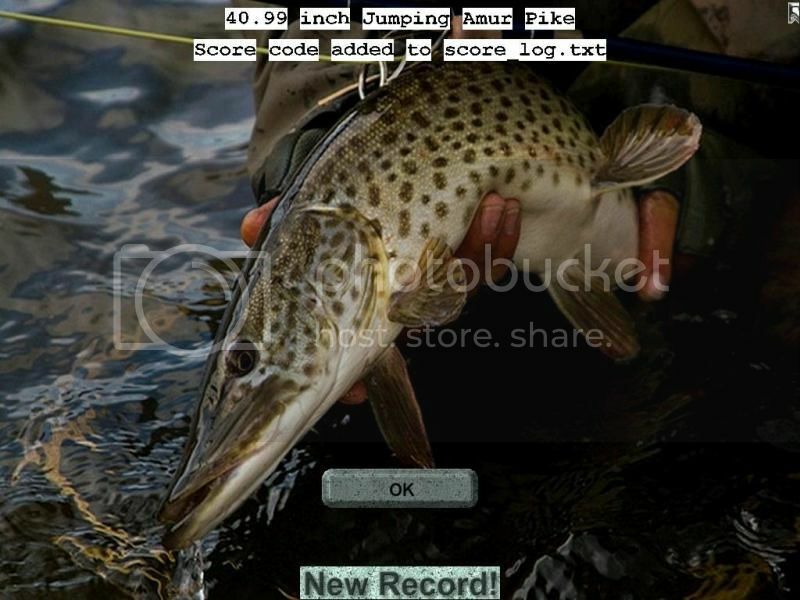 You must also post a picture of your biggest fish caught and caught codes on the Forum before they become valid. 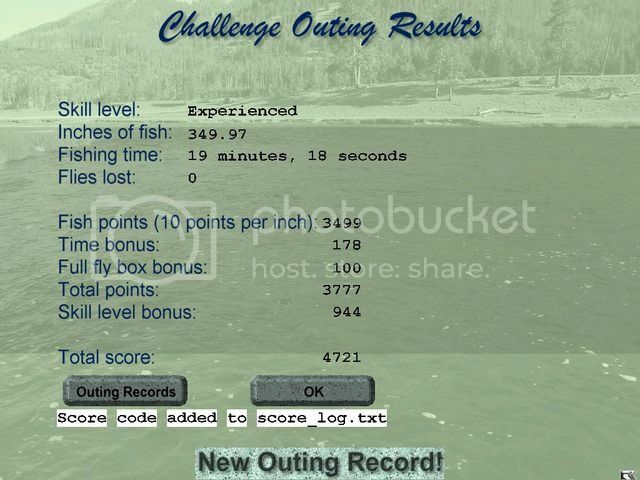 The same applies for the outing challenge scores. Last edited by rwwalleye on Mon Feb 02, 2015 5:16 am, edited 35 times in total. I am new to the forum but not to the game, sadly after a PC crash I stopped playing a few years ago, now I try to come back, every time I tried the challenge an error message appear "can't load site definition 01" or something like that, I have downloaded all the necessary files (flies, fish, food and sounds), but I still can't load the outing. Any ideas or helpful information?. Thx in advance. Regards. A warm welcome to our little Forum. Here we have members from all over the world and language is never a problem. besides your English is just fine! Almost 99% of outing loading errors are related in some way to missing or misplaced files (e.g. nested folders) within the RWFF game folder. Please go to your main RWFF game folder, click on the "content_errors.txt", copy the error file and post it in a new thread on our Technical Support Forum and I will be able to help you with it. Hopefully you will be fishing the Challenge in no time at all! Also to use the latest features of RWFF you must have V.133 or later versions. If you have not updated your RWFF software recently you can go to the "Patch Location and How To Install Them" Sticky towards the top of the RWFF Forum and download and update your RWFF install. I will be gone for the day but I will return this later evening. If you would post your errors text I will be able to help you. Well here's my second try. A higher score and at least no lost flies. Well I guess 3rd time is a charm but we need some more competitors. Martin did an excellent job on this challenge. Excellent scenery, good sounds and definitely some large fish. I believe it's going to take a really high score to win this Challenge. We have until February 1st, so there is plenty of time to fish this challenge. So join in the fun and no matter what score you get, go ahead and post it. Thanks. Martin you did an excellent job. Hi guys: When they said Challenge they meant it in this outing. fought a monster for 15 minutes before he broke the 30 lb leader. I switched to 50 lb and landed a fish but not that monster. Martin: Great job on this outing, I really liked everything about it. Have a great holiday. Good job! Boston Bob! Looks like they are having one hell of a storm in the New York area. The Evening News said it will be a monster and people should get prepared for it and take it seriously. I hope it doesn't travel up the coast and affect your Boston area too much. I haven't heard from Chuck for a while and I hope he is OK as he lives in the New York area. That is a very good score you submitted although Roger is getting serious about setting the pace of the tournament. I noticed Roger is getting plenty of "skill points" in his attempts so he must be using fairly light tackle to complete the Challenge. The "free for all, no bars hold" idea is a very interesting one as one can experiment with the size of his tackle to achieve the highest end score in the Challenge. It will be very interesting to see what kind of tackle everybody uses at the end of the tournament. Keep those big scores coming. Old Badger has not submitted anything yet but when he does I expect the score to be outstanding as usual. Stanley: This will be a "Monster" storm. They named it Winter Storm, Juno. winds 40 to 60 and gusts up to 70 MPH. The airport is already cancelling flights. Here's my entry. I haven't done this for a long time so don't know if it's done right. first 2 times, so I don't know if a couple of these fish or on the list or not? I used the heaviest rod and 50 lb line. 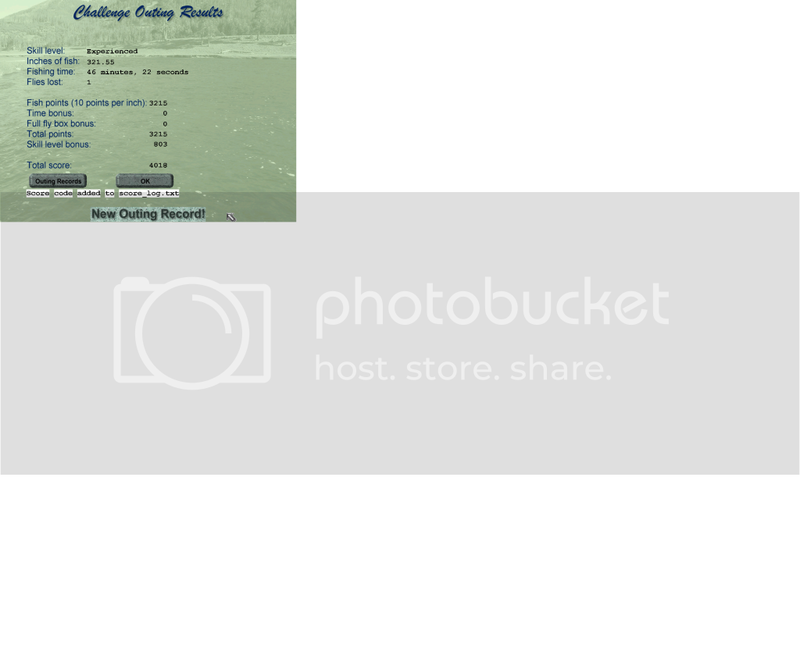 Why do over an image is a 46.47 ? I wish you all great results !!! Well, here is my first attempt at the Tharthar Challenge. Before I go into the details of fishing the Challenge I would like to give my highest praise to my buddy Martin for producing an outstanding outing for the Challenge. The scenes are varied and beautiful and the water movement is really well done. I especially liked the different light and color effects in many of the scenes. 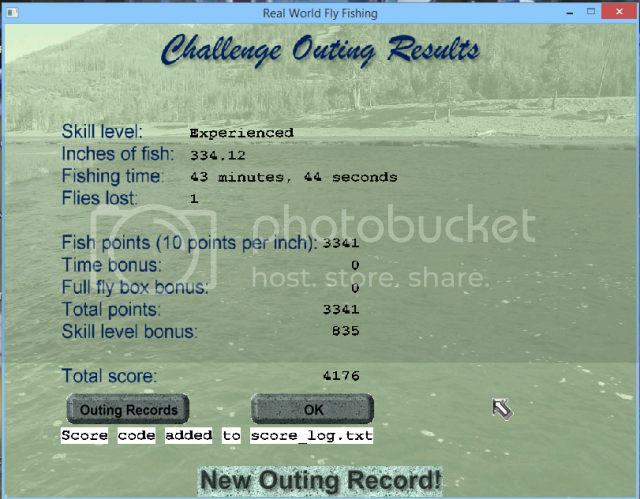 This outing makes fishing the Challenge a really enjoyable experience. On the first scene of the Challenge I hooked into a slow moving submarine that refused to turn even at the greatest rod pressure. I fought it for a while, put it on "pause" and had dinner, and then I returned to finish the job. It took me 32 minutes to tire this fish out and to finally land it. 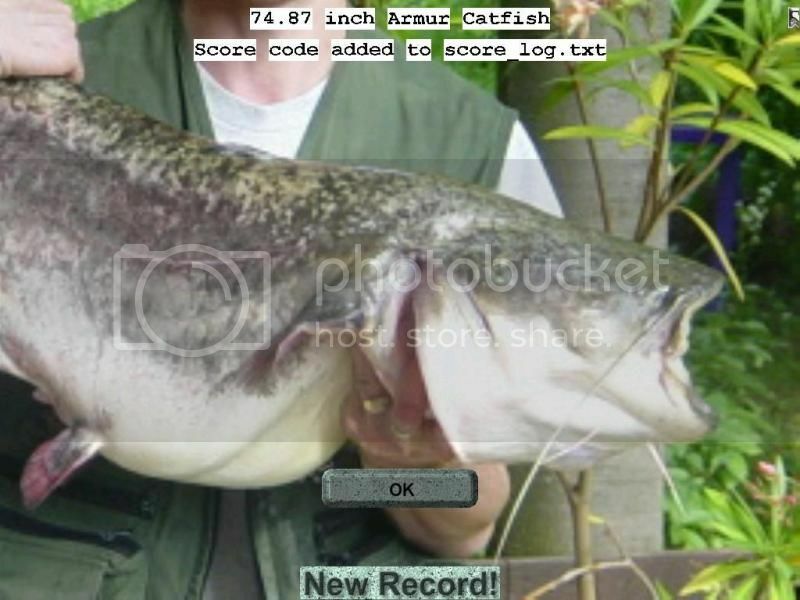 It turned out to be an Amur Catfish of enormous proportions at 74.87 inches! Wow! Like my son Jason (then 4 years old) said when he hooked into a 4 pound Brown trout and fought it for nearly half an hour and finally managed to beach it...."I thought the fish was tired, I am even more tired than the fish". 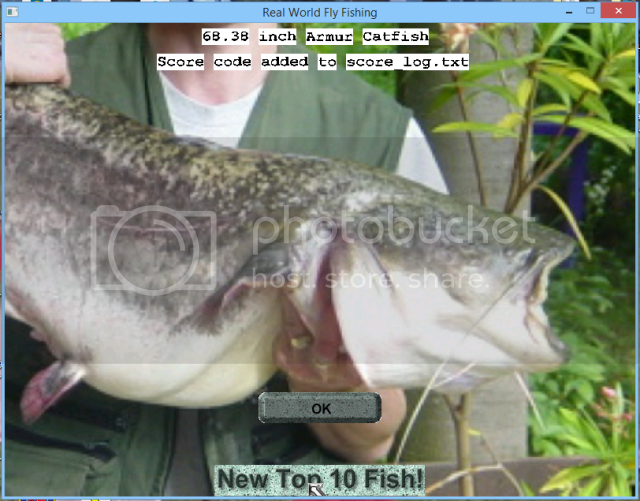 After landing this monster Amur Catfish everything seemed small even at 40 plus inches. I didn't quite break the 5000 barrier but came close. Maybe next time! 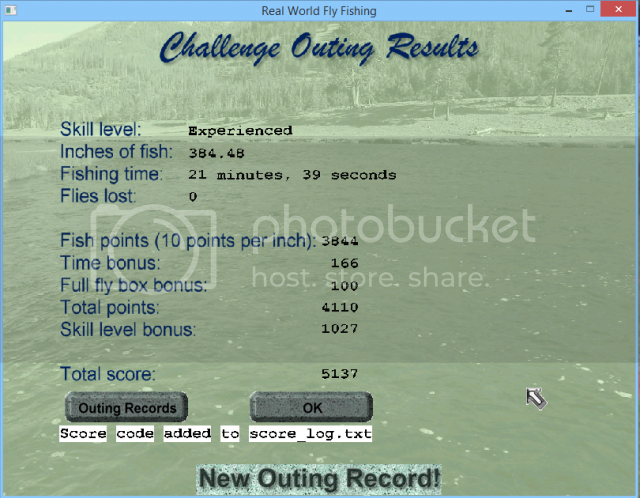 Below are my score and catches. The Tharthar Lake outing is a beautiful outing and well worth your time to explore even if you don't participate in the outing challenge. Thanks Martin for coming up with yet another great one! 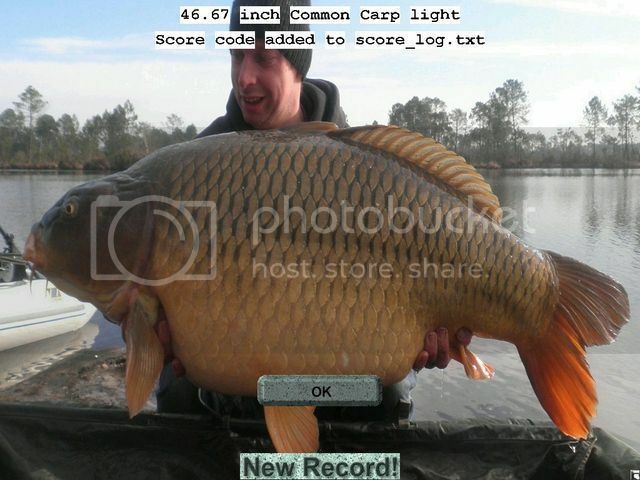 Sorry Roger, I forgot how to get a pic of my biggest fish?